Worlds in Collision comprises only the last two acts of a cosmic drama—one that occurred in the middle of the second millennium before the present era; the other during the eighth and early part of the seventh century before the present era. Prior to the events described in Worlds in Collision, Venus—following its expulsion from Jupiter—was on a highly eccentric orbit for a period of time measured certainly by centuries, perhaps millennia, before its near-encounters with the Earth. While the actual beginning of the drama is shrouded in the mist of grey antiquity and difficult to pinpoint with exactitude, there is a point at which a clearer picture emerges. This is the time when the two giant planets—Saturn and Jupiter—approached each other closely. Possibly they were close for a long period of time, passing near one another as they traveled along orbital paths quite dissimilar to those of today. Today Jupiter moves on an orbit of twelve terrestrial years and is about half a billion miles away from the Sun, whereas we are some ninety-three million miles distant. Saturn is much farther: it is the next planet beyond Jupiter, approximately another half billion miles outside Jupiter’s orbit. They are presently not of the same size or volume. Jupiter is more than three hundred times more massive than the Earth, but Saturn only ninety-five times. In volume, Jupiter is about thirteen hundred times that of the Earth, whereas Saturn is only about eight hundred times that of the Earth. Today Jupiter is actually more massive than all the other planets, Saturn and the rest, put together. The cosmological thought of ancient peoples conceived of the history of the Earth as divided into periods of time, each ruled by a different planet. Of these the epoch of Saturn, or Kronos, was remembered as a time of bliss, and it was made to precede the period during which Jupiter was the dominant deity. Insofar as I could understand the physical events that affected the globe in times preceding the Middle Kingdom in Egypt, I was able to explain them as the results of a disturbance in which both Jupiter and Saturn participated. Various peoples witnessed the events and described them, as a celestial-human drama in different forms: the Greeks, for example, had Jupiter-Zeus, the son of Saturn-Kronos, dethrone his father and banish him, and take his place to become the supreme deity. In Egyptian folklore or religion the participants in the drama are said to be Osiris-Saturn, brother and husband of Isis-Jupiter. And it is not that the wife dethrones the husband, nothing of the kind — there is, instead, a fight going on in the sky in which some body, described as Seth, attacks Osiris and kills, actually dismembers him; and after this lsis travels in search of the dismembered parts of Osiris. You see how the two dramas are hardly at all alike. I believe that my long experience in interpreting dreams and associations of my fellow men probably was of help to me to see similarities where the similarities were not easily seen. An Egyptologist, one of the most prominent Egyptologists of the last forty years (he died several years ago), Sir Alan Gardiner, wrote—and I read it twice in his writings3— that he could not understand who Osiris was. Osiris occupied an extremely important role in the religion, folklore, and rites of Egypt. But who was he? Was he a king who had been killed? — Gardiner could not figure it out. He did not understand that Osiris represented a planet, Saturn, as did Tammuz in Babylon. Sir James Frazer, author of The Golden Bough, describes in the volume Adonis, Osiris, Attisthe great lamentations and crying for the fate of Tammuz. Similar rites were observed in Egypt for Osiris; and it should be understood that these lamentations were actually for Saturn, because the time of Saturn—the Golden Age of Saturn, or Kronos—came to its end when the supreme god of that period, the planet Saturn, was broken up. The ancient sources all point to Saturn; but how did Saturn cause the Deluge? What did really happen? Suppose that two bodies, such as Jupiter and Saturn, were to approach one another rather closely, so as to cause violent perturbations and huge tidal effects in each other’s atmospheres. As a double star, or binary, they might interact to the extent that, under certain conditions, their mutual perturbation will lead to a stellar explosion, or nova. If what today we call Jupiter and Saturn are the products of such a sequence of events, their appearance and respective masses must formerly have been quite different. 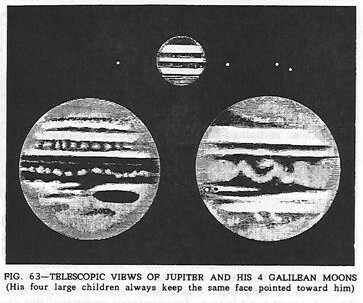 Prior to its cataclysmic disruption and dismemberment Saturn must have exceeded Jupiter in size. 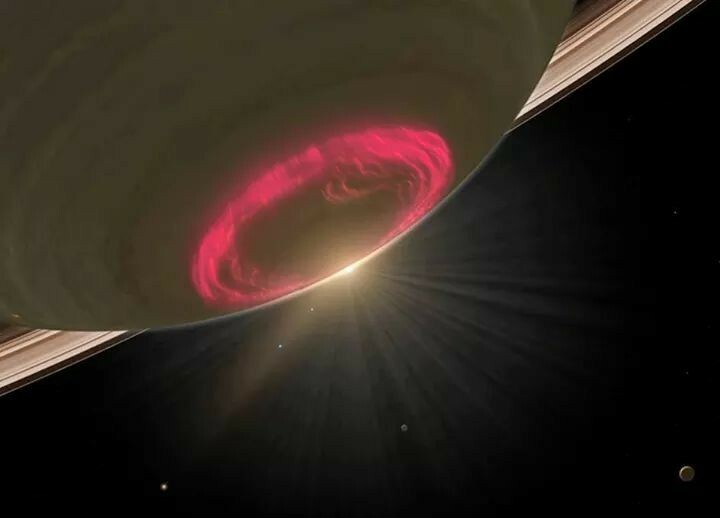 At some point, during a close approach to Jupiter, Saturn became unstable; and, as a result of the influx of extraneous material, it exploded, flaring as a nova which, after subsiding, left a remnant that the ancients still recognized as Saturn, even though it was but a fraction of the size of the celestial body of earlier days. In Saturn’s explosion much of the matter absorbed earlier was thrown off into space. Saturn was greatly reduced in size and removed to a distant orbit—the binary system was broken up and Jupiter took over the dominant position in the sky. The ancient Greeks saw this as Zeus, victorious over his father, forcing him to release the children he earlier had swallowed, and banishing him to the outer reaches of the sky. In Egyptian eyes it was Horus-Jupiter assuming royal power, leaving Osiris to reign over the kingdom of the dead. My conclusion that, as a result of its interplay with Jupiter, Saturn exploded as a nova, I found confirmed in many ancient sources, in which Saturn is regularly associated with brilliant light; but I was led to this idea first of all by a certain clue contained in the Biblical account of the Deluge. The story as found in the book of Genesis starts with these words: “And it came to pass after seven days, that the waters of the Flood were upon the earth”(Genesis 7:10). It is not explained, after seven days of what? Some words seem to be missing here from our text of the Old Testament. It is clear, however, that Isaiah refers to the same seven days in his description of the messianic age to come, when “the light of the moon shall be as the light of the sun, and the light of the sun shall be sevenfold, as the light of the seven days…” (Isaiah 30:36). It is conceivable that the Earth was, at that time, a satellite of Saturn, afterwards possibly becoming a satellite of Jupiter. With the end of the seven days of light the Earth became enveloped in waters of cosmic origin, whether coming directly from Saturn—and Saturn is known to contain water—or formed from clouds of hydrogen gas ejected by the nova, which combined, by means of powerful electrical discharges, with the Earth’s own free oxygen. There are definite indications of a drastic drop in the atmospheric oxygen at the time of the Deluge—the survivors of the catastrophe are said in several sources to have been unable to light fires. The Midrashim and other ancient sources describe the waters of the Flood as being warm;6 in addition the waters may have been rich in chlorine, an element which in combination with sodium forms common salt. Marine geologists are unable to trace the origin of the huge amounts of chlorine locked in the salt of the Earth’s oceans, the Earth’s own rocks being rather poor in this element and incapable of supplying it in the needed quantities. Chlorine may thus be of extraneous origin; being a very active element, it could possibly be present in some different combination on Saturn. After the Deluge many new forms of life came into being, especially plant life. Thus it happened that Saturn was later called a god of vegetation. Frazer in his Golden Bough considered Osiris and Tarnmuz to be nothing more than vegetation gods—so strong was Saturn’s connection with the new forms in the plant kingdom that appeared following the Deluge. The Midrashic sources relate that, during the Deluge, all volcanoes erupted;7 and other ancient accounts assert the same. Changes took place in the lithosphere as well as in the biosphere. Most pronounced, however, were the changes in the hydrosphere — the volume of water on the Earth was vastly increased. And it is of interest that the Atlantic Ocean was called by the ancients “the sea of Kronos”8—indicating that it came to be only after the Deluge. The memory of these stupendous events survived for millennia and vestiges of the cult of Saturn persist even till today. One of these memorials is the feast of light, celebrated in mid-winter: Hannukah or Christmas, both stemming from the Roman Saturnalia. These are all festivals of light, of seven days’ duration, and they commemorate the dazzling light in which the world was bathed for the seven days preceding the Deluge; in their original form these festivals were a remembrance and a symbolic re-enactment of the Age of Saturn. It was said that in that age there had been no distinction between masters and servants — thus in Rome, for the duration of the Saturnalia festival, the household slaves were freed, and were actually waited on by their masters. Also the statue of Saturn which used to stand in the Roman Forum was for a time released from its bonds. This statue, which had bands around its feet, represented the planet Saturn with its rings — it was understood that it was Jupiter that had bound Saturn with these bonds after he had overthrown Saturn. Astronomers are unable to explain their origin, but they must have formed in that event in which Jupiter disrupted Saturn. Now I also want to point out that some scholars associate Jupiter with “birthing” comets. This makes some sense when looking at the Birth of Jesus and the star that the magi saw and followed from the East. Some believe that this star was connected to Jupiter and Venus while some believe it was Jupiter as Saturn. Scholars are even led to believe that these conjunctions somehow were connected to a comet like they believe the flood was connected to a comet. 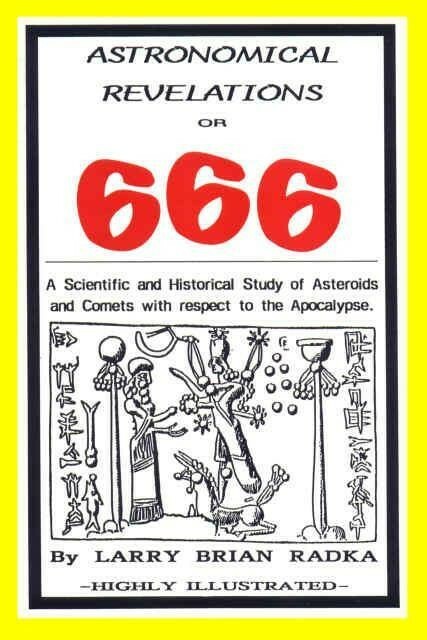 Some modern scholars even go so far to say the deluge comet was Haleys comet. 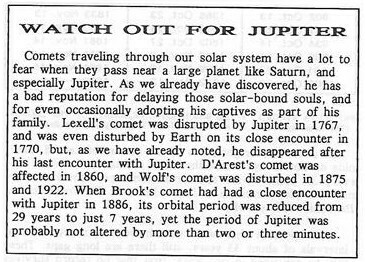 Here are a few screenshots from Larry Radka’s book on Jupiter and comets. You can find his book here for free.